The annual convention of the National Association of College Directors of Athletics (NACDA) is one of the few events where administrators from all levels of collegiate athletics – NCAA (DI-II-III), NAIA, and two-year college organizations (NJCAA, CCCAA, NWAC) – all converge for a week of professional development, networking, and collaboration. 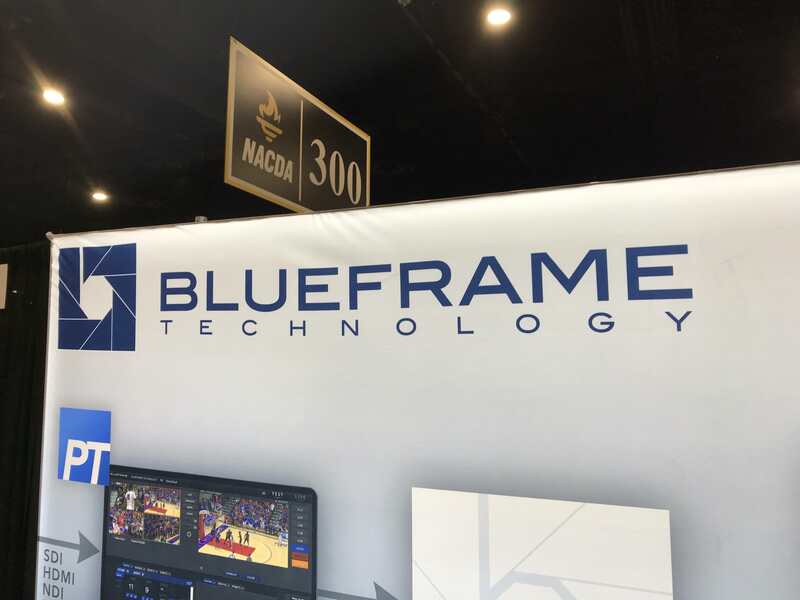 For BlueFrame Technology, the annual NACDA Convention is a key event each year providing many opportunities to connect with current and future clients as well as demo our Production Truck software and streaming services live on the exhibit hall floor. 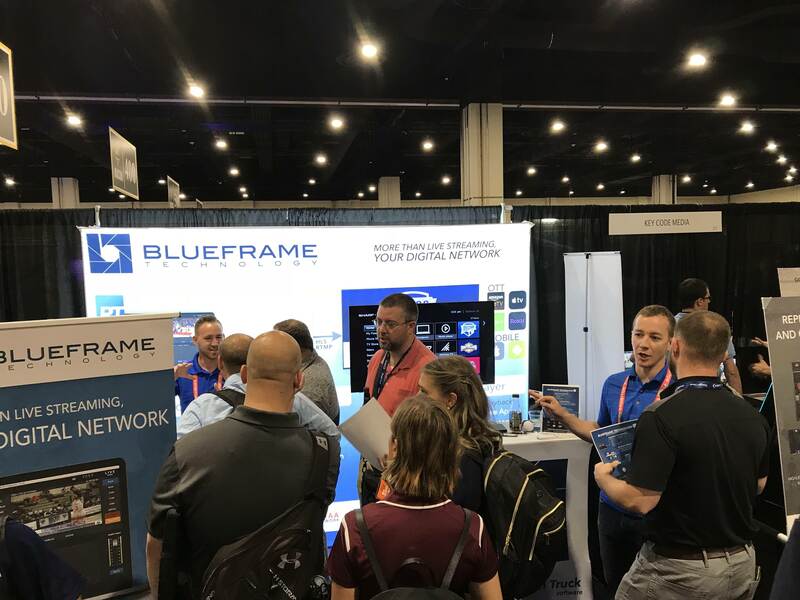 The 2018 NACDA Convention, held in Washington D.C., was the third for BlueFrame since the founding of the company in 2015. We expanded our footprint at this year’s event as a proud sponsor of NATYCAA (National Alliance of Two-Year College Athletic Administrators) – an affiliate group of NACDA. Due to our long-standing partnership with the NJCAA and powering NJCAA TV, BlueFrame has strong roots in two-year college athletics and continues to expand its client base in this specific market. In fact, during the NATYCAA meetings, BlueFrame was pleased to officially welcome Rowan College of Gloucester County (NJ) of the NJCAA as a streaming partner. Rowan Gloucester has one of the most respected athletic programs in two-year college athletics, winning 29 national championships across multiple sports as well as earning the 2018 NATYCAA Cup for the best overall non-scholarship athletic program in the NJCAA. BlueFrame’s ability to provide colleges a professional production solution via Production Truck and robust broadcast distribution options to web, mobile, and OTT (over-the-top) television apps has made positive impacts for a large portion of the NCAA Division II membership. Just prior to the NACDA Convention, BlueFrame was proud to announce the addition of the Central Atlantic Collegiate Conference. and launch of a CACC Digital Network this fall. Once at the NACDA Convention, members of the BlueFrame team were able to speak to several other conference leaders and we anticipate working with over 10 NCAA DII leagues for the 2018-19 season. 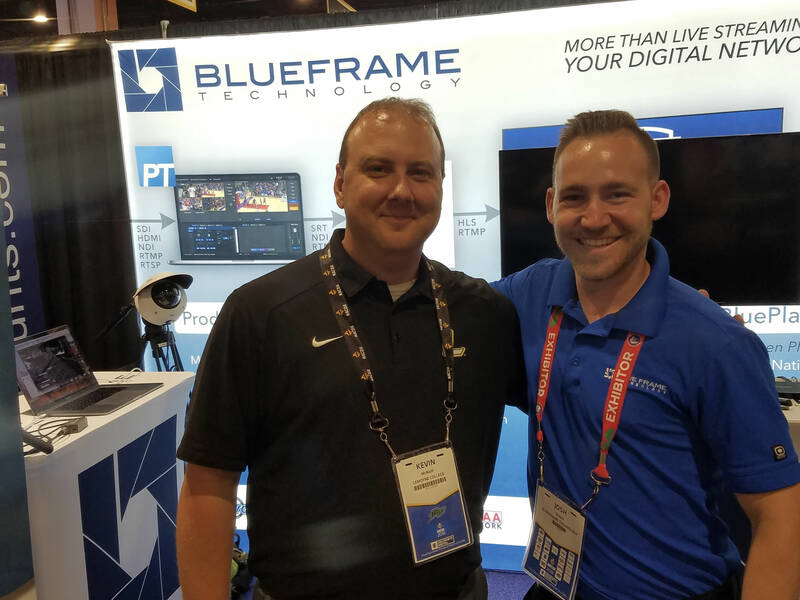 On the floor of the NACDA Exhibit Hall, the BlueFrame team was very active catching up with current and prospective clients. Our team once again set up a live demo of Production Truck in the booth to give everyone a hands-on look at its powerful features and ease of use. A constant sentiment we heard from visitors to our booth was, “I keep hearing great things about BlueFrame and wanted to stop by and learn more.” Hearing comments like this makes all of us at BlueFrame very proud. It means our hard work dedicated to providing high-quality, cost-effective video streaming solutions for the college athletics market is paying off and our clients are advocating for us to their peers. We greatly value the relationships we have formed with the great organizations, conferences, and institutions and look forward to working with many more this upcoming season. A special thank you to Ron Case for his help in making BlueFrame’s involvement with NATYCAA such a great success. We look forward to attending the 2019 NACDA Convention in Orlando, Florida, and building upon our experiences at this great event the past three years. If you were unable to connect with BlueFrame in Washington D.C. and would like to learn more about why our ‘end-to-end’ video streaming solutions is considered the best in the college market give us a call at 855-812-2740 or email us at sales@blueframetech.com.